Kwinn was a part of the fantastic early portion of the Joe books. He was a honourable mercenary who hampered the efforts of the Joes as much as he helped them. Note: We’d assume “Kwinn” is an alias, based on Bob Dylan song The Mighty Quinn (Quinn the Eskimo) . Height: 6’10” Weight: 260 lbs. Prying open heavy steel doors bare-handed (while underwater no less). Laughing off a full-force drop-kick to the back of the head from Scarlett. Climbing back into a moving plane with Snake Eyes clinging to his leg, while receiving multiple blows to the head with a heavy steel wrench. 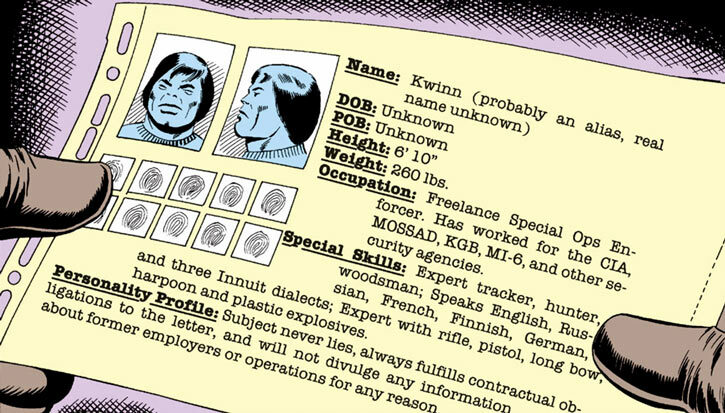 Kwinn possessed several non-combat related skills as well. He was a skilled hunter, survivalist, and tracker. He was also multilingual. He could fluently converse in English, French, Russian, Finnish, German and three Inuit dialects. Kwinn routinely wielded and fired a .30 M1919 Browning medium machinegun in combat. The weapon itself weighed 34lbs (without ammunition). It was actually designed to be fired from a mount (either a tripod or on a vehicular mount). Kwinn fired the weapon with unerring accuracy… from his hip. Outside of his machinegun, Kwinn carried a series of fragmentation grenades, a large flashlight, and a combat knife. In case of emergencies, Kwinn kept a small flexible saw-blade in the hollow heel of his right boot. Kwinn first encountered the G.I. Joe strikeforce in the frozen north. 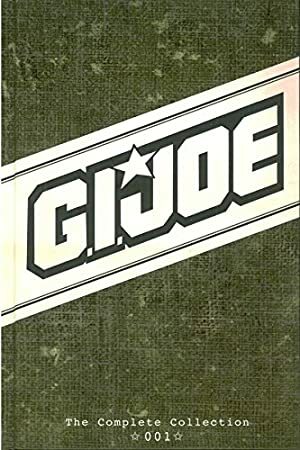 The Joes were investigating who had attacked a top secret American research station. Kwinn ambushed them there. Kwinn had been hired by the Russians to steal records from the station. The records contained information about broadcasting “paranoia waves” over long distances. Left with little choice, the Joes surrendered. Kwinn left with the records and the Joes’ weapons. Unwilling to give up, the Joes rushed ahead and set up an ambush for Kwinn. The ambush went of without a hitch, but Kwinn had anticipated their maneuver. Left with little choice, the Joes attacked Kwinn head on. They were easily defeated by their much better prepared foe. Yet the Joes’ bravery impressed Kwinn, and he chose to show them mercy. After all, his contract didn’t specify their elimination. 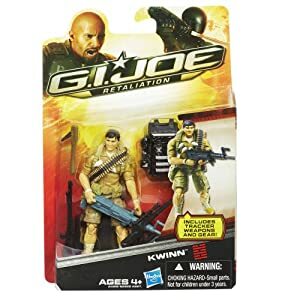 Kwinn abandoned the Joes after disabling their weapons. He then delivered the plans to the Russians. Upon receiving the plans, the Russians confirmed that Kwinn had fulfilled the contract. At that moment, Kwinn revealed that he left the Joes firing pins a mile away their location. He also revealed to them that the Joes were on their way. Months later, Kwinn had taken a contract with Cobra in Sierra Gordo. His contract stipulated that he protect a shipment of computer chips. The chips were in the possession of Dr. Venom, one of Cobra’s top scientists. When the Joes arrived in Sierra Gordo, they attempted to take Dr. Venom down. Unfortunately for them, Kwinn was present. The mercenary defeated the Joes and took them prisoner. He promised that no harm would befall them for as long as they complied with his wishes. However, Dr. Venom had made no such promises. He tried to kill Snake Eyes at the first opportunity. Kwinn saw Venom’s actions as a betrayal of his own oath. He promised Venom that there would be consequences when the job was complete. In that moment, Venom decided to eliminate Kwinn at the earliest opportunity. 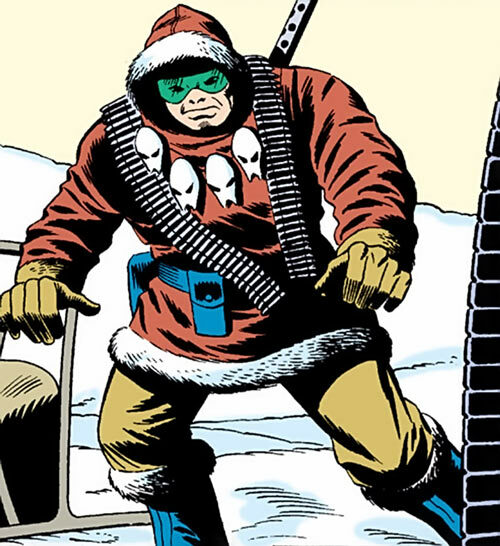 Kwinn took the remaining Joes, Dr. Venom and the chips to a small island bunker where the Baroness met him. As she examined the chips, Kwinn realized that Snake Eyes had survived and was preparing to attack. 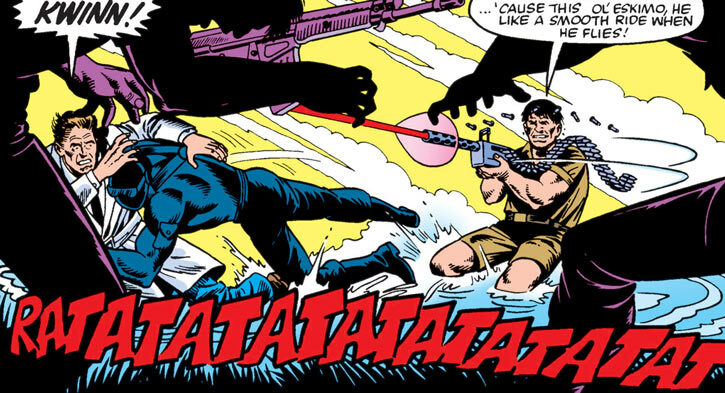 Kwinn fended off Snake Eyes assault, while the Baroness fled. Meanwhile, Dr. Venom tried to shoot Kwinn in the back. Snake Eyes tackled Dr. Venom before he could shoot. Kwinn, having recognized Venom’s intentions, watched while Snake Eyes savagely beat him. With the three men distracted, the Baroness bombed the island. The explosion left nothing but wreckage behind. The Joes (whom Snake Eyes had freed during the confusion) assumed that everyone had died. In reality, Kwinn had shoved the two smaller men into the bunker before the bombs hit the island. The explosion caused the bunker to sink to the bottom of the river. It trapped the men under dozens of feet of water. Having little choice, they called a truce until they escaped. The three men waited for the bunker to fill with water and then Kwinn forced the door open. As Dr. Venom swam past Kwinn to freedom, he struck him in the head with a wrench and left him for dead. The blow stunned Kwinn for a few seconds, but he recovered and swam to the surface. When he broke the surface, he found Snake Eyes and Dr. Venom surrounded by what remained of the Cobra troops. 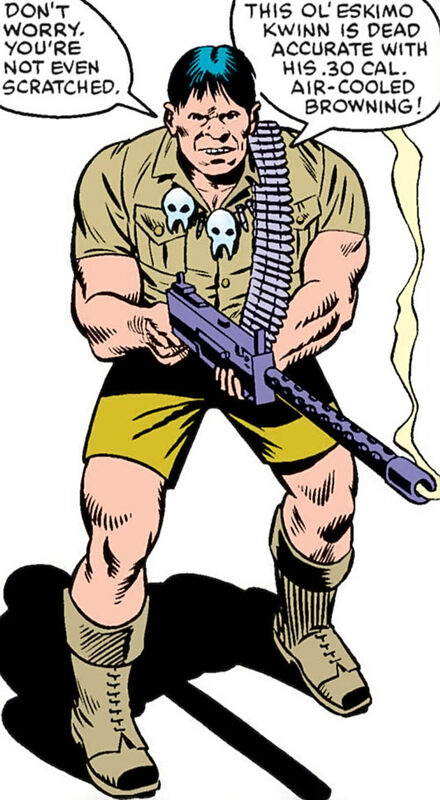 With uncanny calm, he killed the Cobra soldiers and took Venom prisoner. He then convinced Snake Eyes to spare Venom’s life since they needed him to pilot a plane. The three men stole a plane from the Sierra Gordo air field. They set a course for America. Venom attempted to kill both Kwinn and Snake Eyes on the flight, but was foiled both times. The plane eventually crash landed on a Californian beach. Kwinn and Snake Eyes were taken into immediate custody. Venom was released as Cobra lawyers were present at the landing zone. 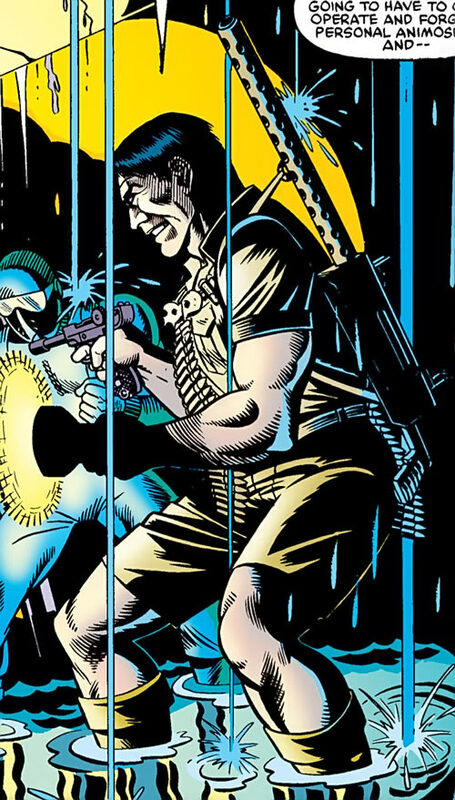 Unwilling to let Venom go, Kwinn and Snake Eyes broke out of prison. They set about tracking Venom down. 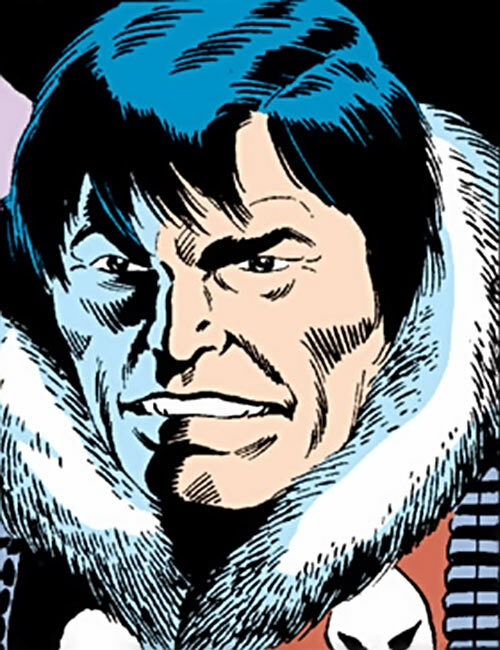 Kwinn used his former contacts in Cobra to find out where Venom would most likely be. 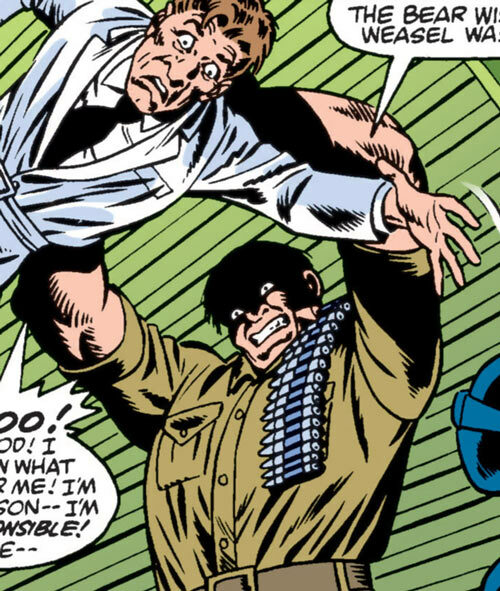 Cobra was assaulting G.I.Joe headquarters when the two finally caught up with Venom. Surprisingly, instead of killing Venom Kwinn chose to spare him. In that moment, he had decided that he was no better than Venom, and as such had no right to end his life. He promised Venom that he would not harm him for as long as he lived. With that he turned and walked away… and Venom shot him in the back gloating all the while. Fate chose that moment to play its hand. The live grenade that Kwinn had been holding in his hand dropped to the ground and rolled to Dr. Venom’s feet. The ensuing explosion killed Dr. Venom. Kwinn was given an Inuit funeral by Wild Bill and Snake Eyes at the conclusion of the battle. Kwinn was a atypical Inuit male. He was uncommonly large in both height and girth, though he wasn’t musclebound. His skin tone was fairly light (yellowish), with dark brown eyes. His coarse black hair was cut close to his scalp and his eyes had slight epicanthic folds. Kwinn dressed appropriately for the weather conditions. Under normal conditions, he wore a brownish/yellow shirt, the same colour shorts, and dark brown boots. 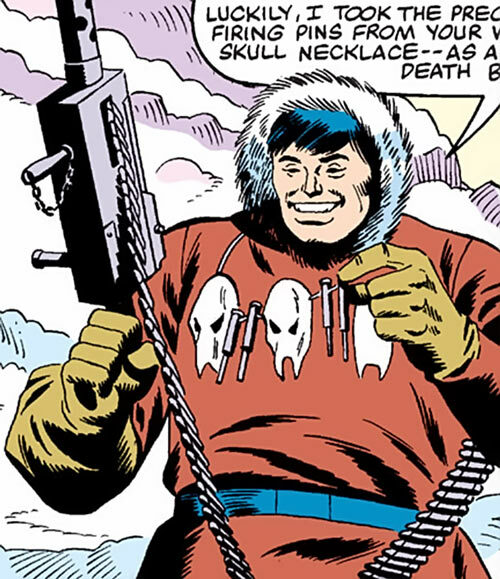 Around his neck he always wore a necklace of weasel skulls. Kwinn was stoic and unmoving. He admired bravery and ingenuity, and when he could he would encourage fair play. He was well spoken and unusually clever. He was deeply spiritual and would constantly make overtures to the spiritual animals and totems of his people. Kwinn made a point of never lying. He always fulfilled his contractual obligations and promises to the letter. He would never divulge information about his former employers or operations for any reason. Kwinn was deeply vengeful. Any perceived slight against his honour would be met with brutal repercussions. Growth is Always On, Form Function and Already Factored In. Skin Armour is Form Function, and only applies vs. blunt and unarmed attacks. Languages (Finnish, French, German, Inuit Dialects (x3), Russian), Scholar (Hunting, Wilderness Survival), Sharp Eye, Shtick (Mighty Thews (Heavy Weapons)). Creepy Appearance (Height and Bulk), CIA toward Keeping his Word, CIA towards Telling Truth, CIA towards Vengeance, CIH of Doctor Venom. LMG [BODY 04, Projectile weapons: 07, Ammo: 06, R#03, Recommended STR 03 (none when using a bipod and the Bracing Bonus), Advantage: Autofire, Drawback: Long Reload, MPR (heavy and cumbersome – cutting movement speed by 1 – unless your STR is 2 APs above the Rec. STR]. Offensive Grenade (x3) [BODY 01, EV 07 (Area of Effect 1 AP), R#03, Grenade drawback]. Combat knife [BODY 05, EV 03 (06 w/STR)]. Writeup completed on the 10th of August, 2017.